Remember my seafood and miso soup? It was an experiment, but a very tasty experiment which paid off. Since then, I've adapted my recipe a little to allow for a different flavour combination - chicken and mushroom. So if you're kosher or can't stand seafood, this may be the one for you! This time around I didn't add rice noodles as being a complete idiot, I forgot to buy them(!) ...but this recipe works equally well without the noodles and is ideal if you're following a no carb / low carb diet. However if like me, you love your carbs, you can find noodle quantities via my previous recipe here. 1. Wash and chop the mushrooms and pak choi. I cut the pak choi in half lengthways and kept the mushrooms fairly large as both will reduce anyway once you start to cook. Chop the chicken into small pieces / strips. 2. Shallow fry the spring onions and chicken until the chicken is cooked. 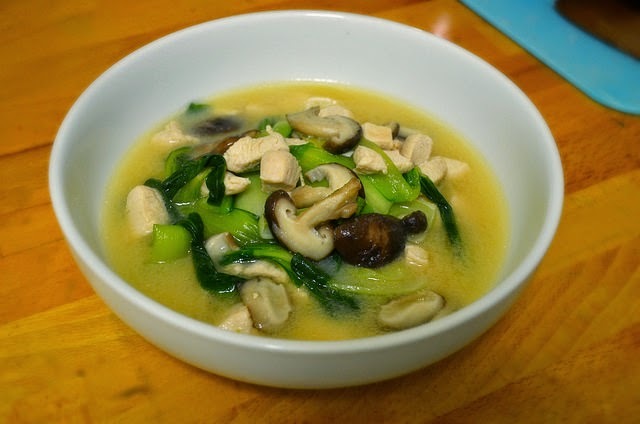 Gradually add the mushrooms and pak choi. 3. In a separate bowl, mix together the white miso paste and water. You can add vegetable stock or chicken stock instead of water if you prefer - however I found the soup nice enough without stock. Add to rest of the ingredients in the pan. 4. Slowly bring to the boil. Once boiled, continue to simmer. You can add vegetable and chicken stock if you wish, but when I tasted mine, it had plenty of flavour already. Simmer for 5 minutes and then serve.